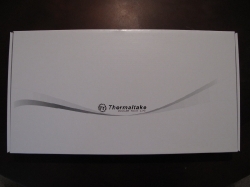 Thermaltake is a name we usually associate with a chassis, power supply or cooling system. 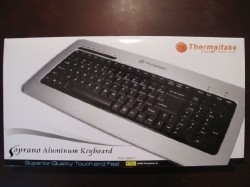 When considering buying a keyboard, most don’t think about Thermaltake. Choosing a keyboard is non-trivial, with little differentiation between one keyboard and the next, since the button layout is generally the same. Even hotkeys have become standard, with most keyboards having hotkeys for internet, email and volume at the least. In order to assert its excellence, the Thermaltake Soprano Aluminum Keyboard will have to excel in the only major differentiating factor, feel. 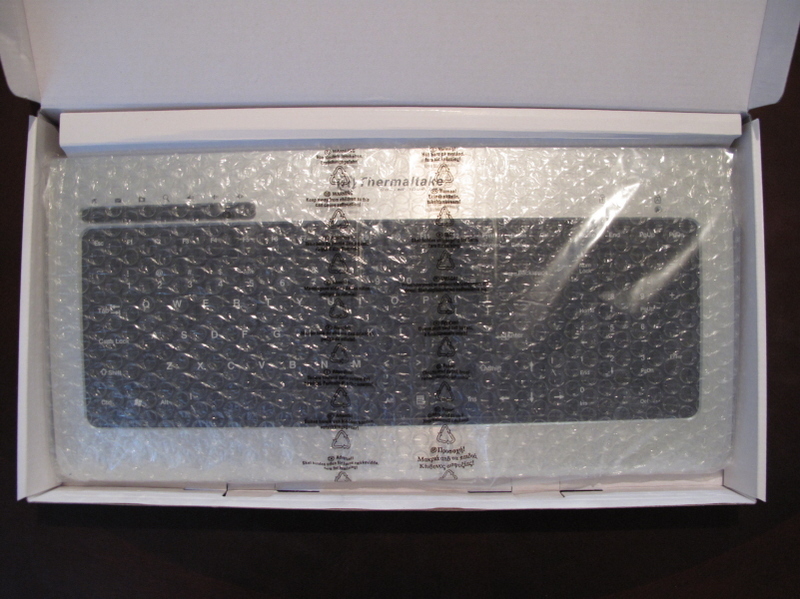 The keyboard comes in a plain white box, with a sleeve around it, wrapped in plastic. The sleeve has a picture of the keyboard on the front, and more details about the product on the back. The backing has a list of features and various pictures highlighting different areas of the board. 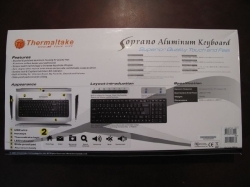 All of the major writing on the packaging is in English, with one sentence in eight other languages directing users to www.thermaltake.com for more information about the product. 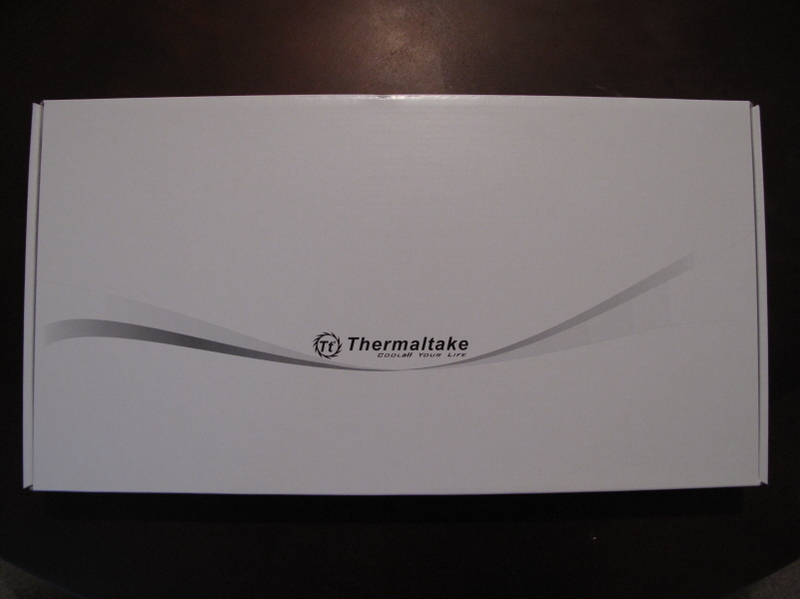 After sliding off the sleeve, we reveal a plain white box with the Thermaltake logo. 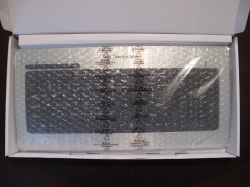 Opening this box reveals the keyboard, wrapped in bubble wrap, and sealed in plastic, with the USB cable neatly held together with a twist-tie. The keyboard also comes with a user manual, which describes some of the features, along with the warranty and repair information. Great review. Chose this over the Enermax Aurora, and I hope I don’t regret it. I’ll be back if I find it stinks like all of Thermaltake’s other products. Over all a great review. Your ability to describe and review a product with a twist of humor makes your articles fun yet informative to read. Keep up the good work. BTW, the comment about low profile keys was absurd any moron knows better. You are correct, I never explicitly said that the keys were low profile. I must have assumed that would be gathered from the side image showing the technology of the key. I apologize for not being explicit. I’m surprised there is no mention whether this keyboard has low profile key or not. From some of the pictures, which were all taken from bird’s eye view, it looks like low profile keys. Even some random user on Amazon said out right it is low profile keys.